What do Salvador Dali, dreams, Porsches, and a Los Angeles Artist community have in common? Combined they are the muse of Automotive Artist Stéphane Dufour. Born in France, this multi-talented artist travels between his studio in LA and France. Stéphane considers each day a chance to turn his dreams into reality, to manifest his fantasy in a painting, make it tangible through sculpture or wearable through clothing. I had a chance to interview automotive artist Stéphane on his inspiration and motivation for creating Car Art and called him in his studio in Los Angeles. The Studio is located in an artist community -- an inspiration pit where artist stimulate and inspire each other. Like Salvador Dali, Stéphane keeps a notepad at his bedside to record his dreams and visions before they are lost in his subconscious. Then this dream starts to become a part of his live with periods of intense reflection interspersed with distance. 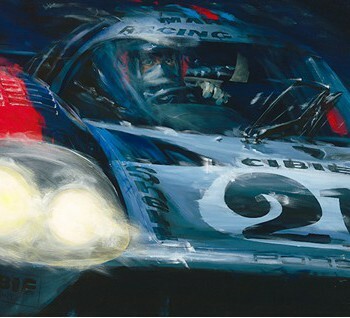 He explained that for one of his latest artworks he had a dream about two of his favorite Porsches and how they could be brought together in one painting. Determining this composition took over five months of thinking and sketching before he was able to start on the actual work. For this process a fast-growing collection of the photos Stéphane makes each day in the streets of LA are of great help. Seeing such stunning cars each day is one of his reasons for living in the United States – continual inspiration. Surrealist works show the fantasy and dreams of artist with elements of surprise. While some of Stéphane’s work is more realistic, he shifts perspective by condensing the shape of sports cars in an almost toy-like sculpture while still perfectly capturing the main characteristics of the car. Stéphane states that the lifestyle of artists like Dali inspire him to remain creative, to find new forms and expressions of art like the t-shirts. When I asked Stéphane what made him start creating sculptures he said, “I wanted to have another feeling for my hands and started sculpting.” His sculptures almost invite the observer to be touched and follow the soft lines and curves with his or her fingertips. It is no surprise that he is often asked at exhibitions and car shows if his artworks can be touched. As a young art student Stéphane already knew that cars would be the topic for his work and that has never changed. Despite the fact that it hasn’t been easy to make a good living with car art. Stéphane used to have his own gallery but decided to close it to focus on his art. 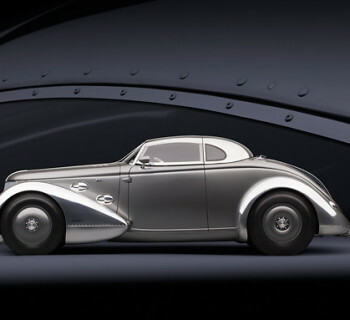 Automotive art is increasing in popularity thanks to people like Jay Leno who promote the automotive artists and their works. 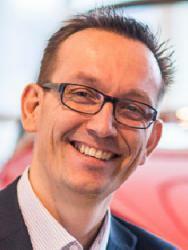 The following video will give you a good impression on this automotive artist. 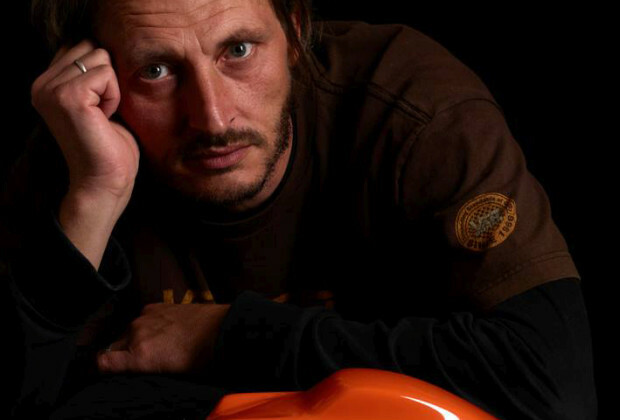 You can find more information on Stéphane Dufour and his automotive art on his website. Hope you liked reading this interview. Do you like his sculptures? Please share your comments below. This blog was posted first on February 27th 2014.